Panel core is polyurethane form, using non CFC propellant. All locks are actuated from inside the enclosure with a standard type Allen wrench. All access holes are to finished with vinyl caps on wall and ceiling panels on floor panels. Gaskets are NSF approved vinyl extruded gasket. Coolers and Freezer doors are of hinged and flushed type with a clear opening of 860 x 1980. Provide door locks of Kason Brand. 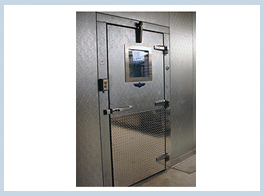 Coolers and Freezers doors are provided with Kick plates of 610 mm height of No. 16 gauge stainless steel on both sides. Doors are having Built-in cylindrical lock, with cam lift-type self-closing door. Bottom of doors are provided with sweeping rubber wiper sealing gasket.